Viewer ActiveX SDK is a fully featured, ready to incorporate facsimile of the End User PDF-XChange Viewer, again embedded within a Window of the developers application, the developer is able to hide and disable most of the controls and functions within the SDK and some GUI tailoring is possible - but Tracker Software branding is present and required from the 'About' Window of the embedded viewer. ...... And is included in the Viewer PRO SDK bundle. Clarion Developers have the choice of using our generic toolkits, or our Clarion specific SDKs which offer Clarion specific Help and Examples, along with comprehensive classes and templates for all versions of Clarion from C5b and up, making its major functions simple to incorporate into their project. *Add & apply Custom Stamps from any Image or PDF File, even your Windows Clip board ! *Type directly on any PDF page, not just Adobe enabled forms documents - in Typewriter mode. Easily and reliably finds and replaces text in hundreds of files. A Viewer activex control, can display images in full resolution. Everything needed to Create and Manipulate Adobe PDF files efficiently. 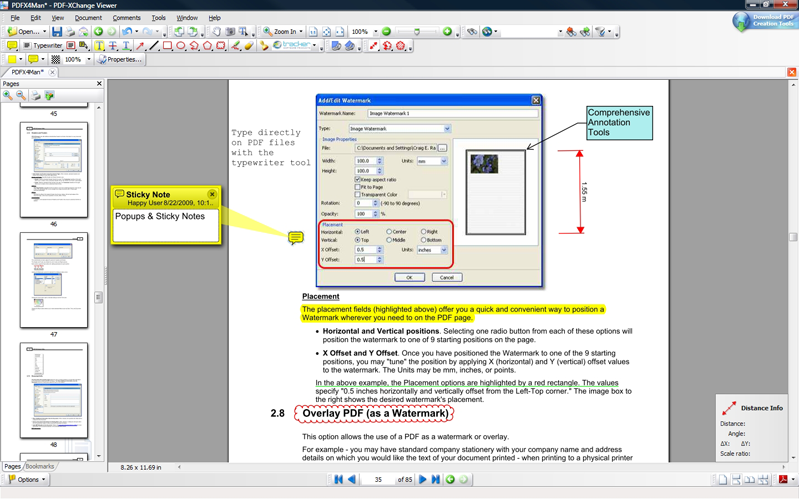 ActiveX control to view/manipulate PDF files. An advanced modeling and simulation program for dynamic systems. WSQ viewer/converter, Reads/converts between WSQ and 11 other file formats. Browse and analyze binary files in MS Windows. ClipViewer is powerful clipboard extender. ShellViewer is a must-have utility for anyone who works with image files. Conversion and interchange software reads and writes tape and data files. Qweas is providing links to PDF-XChange Viewer SDK 2.5.203 as a courtesy, and makes no representations regarding PDF-XChange Viewer SDK or any other applications or any information related thereto. Any questions, complaints or claims regarding this application PDF-XChange Viewer SDK 2.5.203 must be directed to the appropriate software vendor. You may click the publisher link of PDF-XChange Viewer SDK on the top of this page to get more details about the vendor.